But we must remember that for command of means the monks depended upon neighbouring kings and cities. It was an act of surpassing merit of excavate caves or adorn Chaitya-halls for religious communities. Kings remitted the taxes of whole villages, which thus became the monastery glebe. Noble men and great ministers devoted vast sums to the making of images, cloisters and shrines. There is an inscription in the Kuda Caves which shows that a whole family of king's officers, including the daughers-in-law, joined to contribute the expenses of the vaious definite items necessary for the making of a Bauddha chapel. In the Karma thus accumulated not one of this loving and obedient group must be left out! 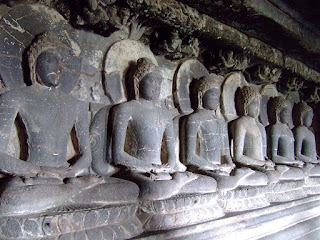 Here at Ajanta itself Cave Sixteen is made by a minister of the Vakataka princees known as Varahadeva; Caves Seventeen, Eighteen, and Nineteen by a minister of a tributary soverreign or great noble called Aditya; Cave Twenty by a man of evident wealth and distinction, whose name is Upendra Gupta; and the Chaitya-hall, Cave Twenty-six, by the abbot Buddha Bhadra with the special assitance of hsi subordinate Dharmadatta and his own disciple Bhadra Bandhu. Throughout the west country it was long fashionable, even for houses that were themselves devoted to Shiva or to Vishnu, to make these benefactions to the Bauddha friars. And as time went on it became customary to add an inscription, with the prayer that the merit of the act might redound to the benefit first of the father and mother of the donor, and then of all living beings-a dedication that is still common amongst certain Buddhist peoples. From Caves Sixteen and Seventeen, then, it can hardly be doubted that the great power, within whose territory Ajanta lay, was that of the Vakataka princes, whose sway is supposed on other grounds to have covered a large part of Central India, from the end of the third till the middle of the sixth centruies, their dynasty having been powerful enough to take a queen from the family of the great Chandra Gupta of Pataliputra, between A.D. 420 and 490.
Who were these Vakatakas? Where did they regin? What was the nature of their kingdom and their power? The inscription on Cave Sixteen claims that Harisena, the king under whom both it and Seventeen were excavated (A.D. 500 to 520), had conquered amongst other places Ujjain, Orissa, and Koshala. Are we to suppose from this that they were Rajputs reigning in Malwa, that country of which Hiouen Tsang said a century later, that it could only be compared with Magadha, as the home of learning? And were the tributary Asmakas-whose minister Aditya made Seventeen, Eighteen, and Nineteen-a mere local power, confined to the immediate neighbourhood? How urgently the history of India calls for students who will search it out in the light of its geography! An anxious antiquarianism has been very useful in providing a few data and starting -points for real work. But the day has come when we are able to realise that, except as the great stream of the Indian story carries it, even Ajanta has little value. We must know how it stood related to the life of its period; what it did for the world; who loved and served it; what joy they drew from it; and a thousand other truths about that living past which surrounded it birth. No one has yet troubled to depict the social conditions out of which it grew. Yet this is the very thing that we must know. The network of strong cities that must have surrounded every focus of ecclesiastical power and learning is non-existent as yet in the notional imagination. 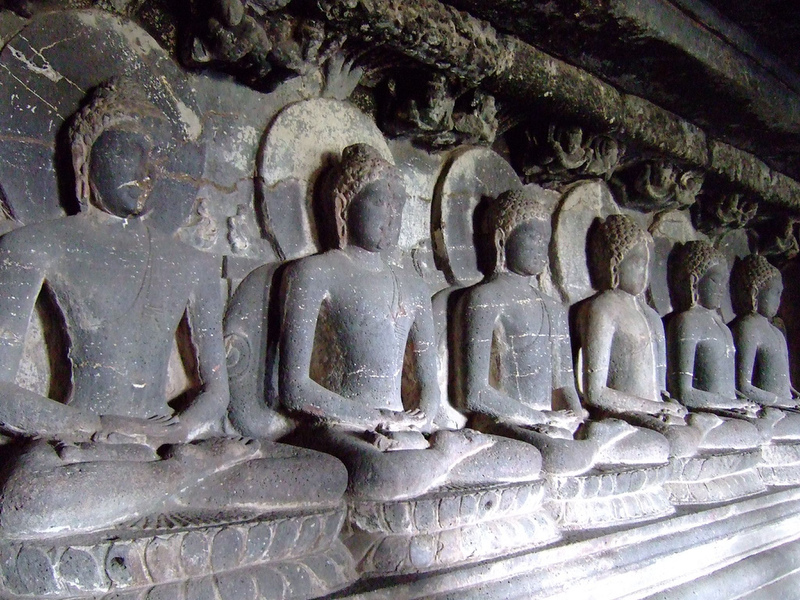 Yet only a detailed study of the whole countryside can give us the real clue to the development of sites like Ajanta.